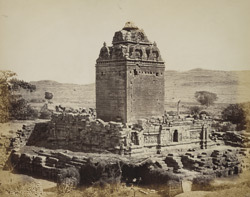 This ruined temple dates from the 6th Century, Maitraka period and is one of the earliest Hindu temple in Gujarat. The sanctuary is raised a high basement and is covered by a pyramidal roof capped by an amalaka and decorated by 3 large arch-like blind windows. The passageway around the sanctuary and the mandapa that was probably at the front on the east are no longer existing.